Have you ever felt like your life was spinning out of control? Like no matter what you do, nothing goes according to plan? Maybe you envisioned yourself reaching a certain level of success, and now it doesn’t seem like it could ever happen. Maybe you feel like you deserve more than what you’re getting. Awaken the Giant Within tackles all of these issues and teaches you how to lead a happier, more fulfilling life. This book is packed full of actions that you can do to get what you want out of life, whether it’s happiness, success, love, etc. It also tackles the issues of addiction and recovery. We have compiled a list of several actions you can try to improve your quality of life, success, self-development, happiness, physical health, finances, and more. You don’t have to do all the actions listed here; even doing two or three of them will create a marked positive change in your area of choice. The best part is, most of these actions can be done from the comfort of your home! 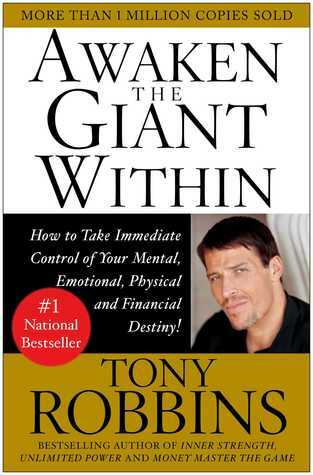 Anthony Jay "Tony" Robbins is an American author, entrepreneur, philanthropist and life coach. Robbins has helped more than 50 million people from more than 100 countries transform their lives and their businesses through his books, audio programs, health products, live events and personal coaching. Robbins is the founder of several companies that earn approximately $6 billion in annual sales. Accept responsibility to make a change. Follow your ends values, not your means values.